Jan 30 How To Stop The Self-Sabotage To Become A Champion? 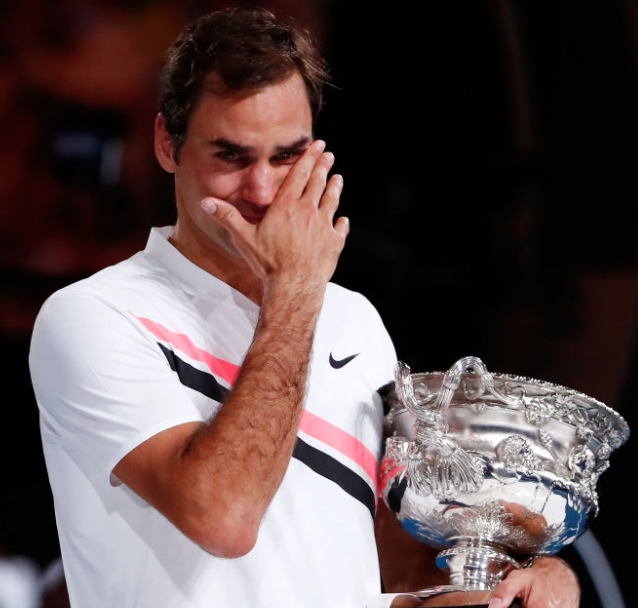 Roger is overwhelmed after winning the 2018 Australian Open. Such a humble man. If you have been following Cazinc on social media, you will know how much our team love Roger Federer. While studying my Coaching and Therapy, I researched and wrote reports on successful mindsets. One I chose was Roger after watching him in 2010 when he beat Andy Murray in the Australian Open. He keeps blowing us away with how he manages to stay so cool, calm and collected when he is under pressure, his flawless court presence and his ability to turn a match around. Australian tennis players Nick Kyrgios or Bernard Tomic are often questioned why they can’t be well behaved as other players on tour, like Roger Federer. “Be more like Roger,” they say. But in Roger's early days, he made Nick and Bernard look like saints. During my research, I discovered Roger wasn't always "Mr Cool" on the court, as a talented young player, Federer's on-court tantrums and egotistical temper once threatened to stunt his progress. "I had a tough time getting my act together out on the court, trying to behave properly. For me, that was a big deal," - Roger Federer. "Roger isn't the same person at 36 as who he was at 19," said David Law, who was the ATP communications manager. David worked with Roger and referred to him as a cry-baby, who would mentally break down, throw tantrums and his racquet. What was the catalyst that made "Mr Angry" grow up to become the one of the greatest tennis players of all time? Roger's coach from age nine to eighteen, Peter Carter had the most significant impact on Roger regarding his technique. But a week before Roger's 21st birthday, Peter died suddenly in a car accident, which shocked Roger into maturity. “Peter Carter just kept him on the straight and narrow really and stopped him getting into any trouble,” Law says. “Federer was devastated." Listen to David Law's Podcast on Roger Federer here. What a team! Swiss tennis player Roger Federer (L) and his wife Mirka attend the wedding of Pippa Middleton and James Matthewsat St Mark's Church on May 20, 2017 in Englefield Green, England. Roger learnt by this tragedy. What would have happened to Roger if he continued with the self-sabotage? One thing we know, he wouldn't have won 20 grand slam titles. The question we have for you today is what are you doing, consciously or unconsciously to sabotage your success? Having self-esteem is when you have high regard for yourself when you value who you are. In other words, having self-esteem is when you have a firm belief and respect for yourself. Something Roger suddenly developed and kept building over time, and continues to build today. If you find yourself down a lot and have a hard time feeling fantastic, this is when the anger and self-sabotage begins. Below I have put together three ways to build your self-esteem to lead you to your 20 grand slam wins throughout your life. When you accomplish a particular task give yourself credit, a pat on the back. It may be something as small as thanking someone for helping you or rewarding yourself with something you love to do. Keep giving yourself credit for the things you achieve. I bet if you really thought about it, you do a lot of successful things throughout the day. Start giving yourself credit for all of them. Say good things about yourself. When you accidentally drop or spill something, what are the first things out of your mouth? If the words dummy, idiot, stupid, or any other harmful words, try not reacting to the situation. Take a deep breath and move on knowing we all have accidents. The point here is not to respond to the situation. Give yourself a break, think good thoughts about yourself, and remember to laugh. Accept the good in you. Just like giving yourself credit for the success you have each day, acknowledge the things you know how to do well. There are things you can do better than anyone. If you gave it some thought, you could come up with plenty of things you do well. Think about it, and when you do, write them down. So, the next time you are feeling down go back to the list you made and accept the good in you. Building your self-esteem is going to shift a gear to take more significant risks and have a more fulfilling life. With high self-esteem, you can accomplish anything, just look at Roger. You will find yourself sticking with your goals and taking on any challenge that comes your way. Building self-esteem does take time; however, anything that is going to help you live your life to the fullest is worth it. You can do it; I know you can! If Roger can, anyone can. After all, we are all human! Do you have anything sabotaging your life that you would like to give up? Jan 31 Why Vintage Is One Of The Most Wanted Clothing Of Today?